Earlier last month, I drove through what seemed like the most dramatic driving flood rains the Northeast U.S. corridor had seen this spring to attend the opening of Guilford Art Center’s Soulcology in Metal, a national juried exhibition of artwork created mostly in metal; one of my recent Widget Lockets was chosen to be exhibited. While the windshield was blurring with rain, the wipers not quite holding up as my car started to hydroplane upon exiting the George Washington Bridge in New York, I questioned if this exhibit would be worthy of placing myself in such dangerous travel conditions during the popular Father’s Day weekend. Having driven northward to Connecticut from my suburban Philadelphia-area home several times previously, I rallied that sense of confidence in the familiarity of knowing “I had done this before”. The stellar collection of metalwork this exhibition presented was curated by Guilford Arts’ metalsmithing instructor/sculptor Lanette Barber and juried by artist/educator Robert Dancik. Dancik selected such a cohesive body of metalwork that one could imagine this exhibit taking on its own personality by how the pieces seem to interact with each other, despite each living on its own plinth or gallery wall space. 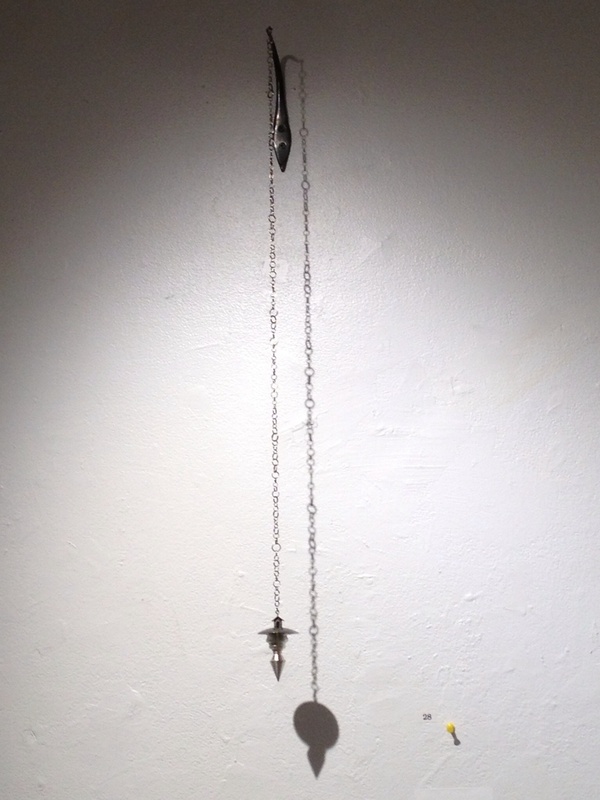 Suspended on the gallery wall from a hand-forged steel hook, Ana M. Lopez’s Plumb Bob: Shelter exudes such a diaphanous look and feel as one approaches this sculptural necklace (if metal could ever be described as diaphanous). The chain is elegantly singular and unified, despite how it is crafted from various-sized jump rings. Perched upon the semicircle is a small metal house with 14K gold key. Stability and a sense of domestic bliss surrounds this work, as plumb bobs are used as a staple for builders to judge verticality and alignment. One may wonder if Lopez is questioning how we interpret one’s own personal state of stability, and the iconic symbol of “a house” as the rock of most people’s familial foundations. Incidentally, I’m quite pleased to be exhibiting my jewelry alongside Lopez for the third time, having been co-exhibitors in both the prestigious Topeka Competition 31 of Fine Craft and the Fine Contemporary Craft Biennial Exhibition in Raleigh, NC. 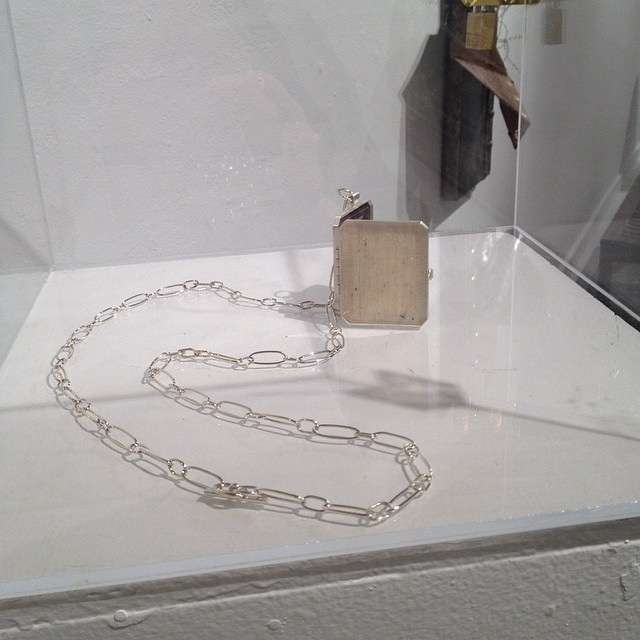 Artist/metalsmith Becky McDonah’s piece, Lost Connection: A Reliquary for the Telephone Cord is one of the first pieces that greets viewers upon entering the gallery. McDonah likes to create fully handmade works from an amalgam of found, ordinary household objects that are then manipulated and contained within reliquary containers, constructed primarily in this case of hammered, formed copper with silver bezel-set stone accents. The surface of this piece is rather ornate – with decorative pearl and twisted wire accents, showing this object to be worthy of holding something perceived as valuable. However, one cannot but immediately notice the careful utilization of old technology, like the now-outdated clear plastic rotary dial from a “princess telephone”, c. late 1970s, combined with the copper-patinated telephone poles that flank the top of this sculpture. McDonah’s Reliquary makes one think how the older wood and metal land-line telephone poles are gradually being replaced by the popularly seen cellular towers. I cannot help but feel a kindred soul type of feeling while reacting to this stunning object of deprecated technology, as McDonah cleverly illustrates in the sculptural round what my own metal Widget Lockets address on the inside, two-dimensional portion as homage to what may soon enough become outdated technology. Jessica Armstrong: “Connected #1”. Powder coated brass, sterling silver, resin, glass microbeads, thread, 2013. Photo: courtesy of the artist. Jessica Armstrong’s Connected #1 is a highly sophisticated and thoughtfully designed neckpiece that utilizes the powder coating medium derived from steel, automotive and industrial design. However, Armstrong does not sacrifice any delicacy or elegance in this piece. One sees how she creates these organic, softer hollow-bezel forms first in metal, but draws elaborately decorative, abstract interiors within each floating element of the piece through combined use of resin, black thread and glass microbeads to form the overall composition of the object. 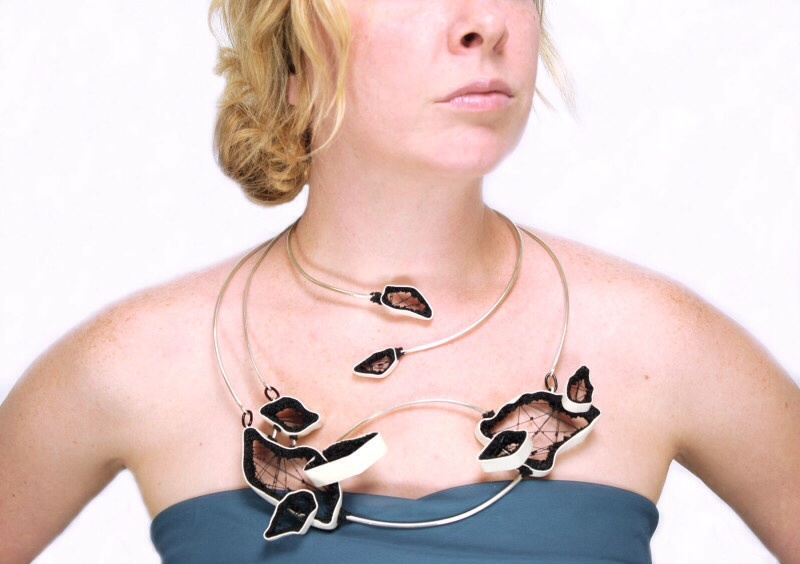 These gorgeous floating forms do appear “connected” as a representation of possibly different continents on a map, or islands/bodies of water that interconnect through the unity of curving wire that encircles the wearer’s neck and body. The dark glass beads and resin work in unison to appear as the sandy, coastal edges of the beach meeting the water’s edge. Brice Garrett, “Collecting the Fragments I”. Found objects, copper, thread, steel. Photo courtesy of the artist. New York City-based jeweler Brice Garrett exhibited work from his Collecting the Fragments series. 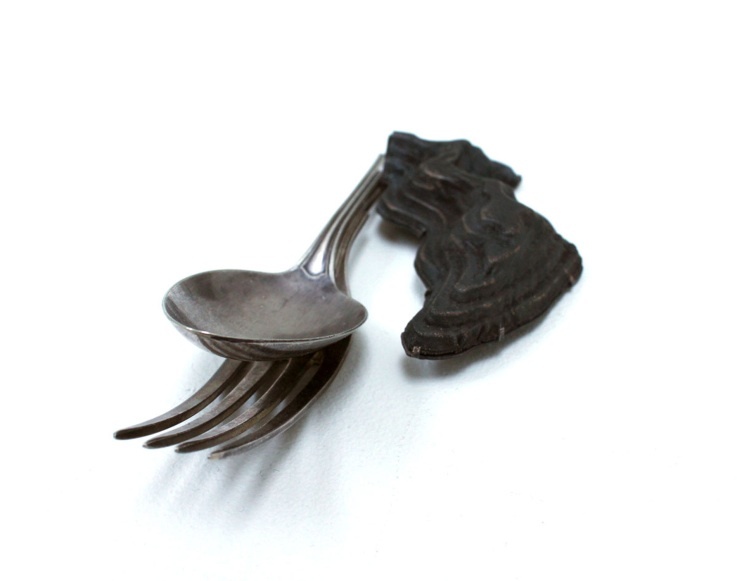 This object is actually a wearable brooch that like McDonah’s sculptural work above, incorporates everyday domestic items such as this vintage fork and spoon. However, Garrett arranges these compositions with the materials of domestic use by sewing with thread to attach the patinated copper, sculptural element to a severed handle of the flatware pieces. Garrett’s work revolves around one’s own consciousness of one’s domestic space; this brooch may be depicting a physical body of land (just as Armstrong’s neckpiece creates land-like icons) but with the spoon/fork combination as the “rockbed” of a homeward-looking glance. Having spent several years living abroad to study his Master of Fine Arts at the legendary Konstfack in Stockholm, perhaps this sense of living outside of one’s most familiar surroundings (even short-term) bears an influence on Garrett’s work. In this particular brooch, the darkened copper, swirling-land-forms right side of the piece could imply even several lands, not yet visited, as the copper is deliberately abraded into overlapping layers of earth-like terrain. 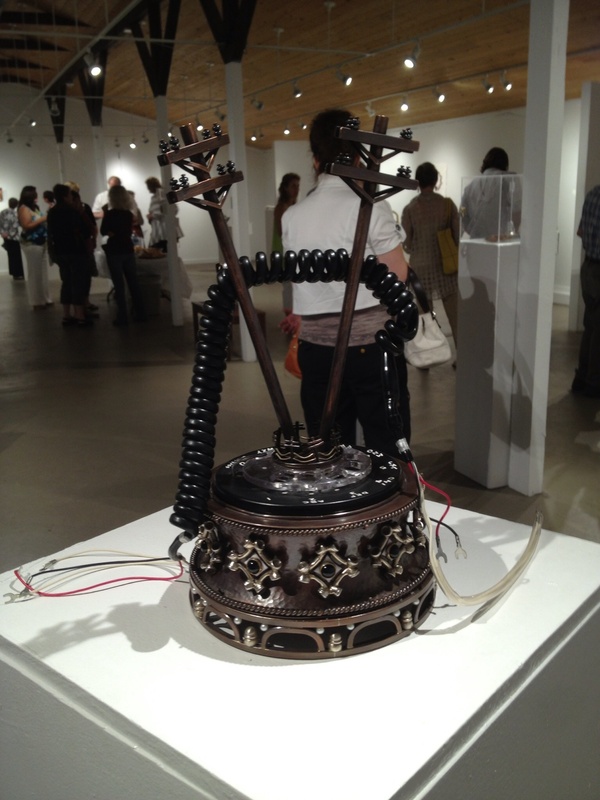 Soulcology: An Exhibition in Metal can be viewed at the Mill Gallery inside the Guilford Art Center, located at 411 Church Street in Guilford, Connecticut through July 27th, 2014. Very insightful article on the show. I’m going to have to get to the Guilford, CT and check this out. Steve, it really is an impressive show of work. I’m glad that you are hoping to check the show out, in-person! I wish I had more time to cover all the participating artists’ work even more in-depth. Thanks so much for stopping in today to comment! Your reviews are always insightful and beautifully written Patricia – a treat for those of us who haven’t the chance to see the exhibitions ‘in real time’. Thank you! Miriam – I’m overwhelmed with gratitude at your lovely feedback re: this exhibit. Thanks so much – you completely made my day! I’ve truly been enjoying reading all three of your very lovely blogs AND hearing more about your beautiful fiber work, also. So happy to hear from you! A beautifully written post as are your widget lockets…. Jen, that is such a lovely comment! Thank you so much for stopping by and sharing such lovely compliments – I really appreciate your visit today! Thanks! piece has a light hearted quality about it but at the same time captures the beauty and elegance of a time gone by. I feel confident you were pleased to have braved the elements. I love seeing your widget lockets too. Sharon, I love when you stop in to visit my blog because you always share such elegant prose about your reactions to reading about all the artwork discussed. I agree – seeing Jessica’s “Connected” necklace in-person was quite spectacular! And Becky McDonah’s sculptural piece did in fact show a playful side, but immediately “grabbed me” when I saw how the various telephone gear was vibrantly arranged into the reliquary. Family/friends who happened to be visiting the Guilford CT area the week before I arrived went to see this show on my insisting. They ADORED Becky’s piece the most – as it strikes a chord with anyone who remembers landlines and the ole rotary phone! Was great to hear and discuss their reactions too. I hope things are well for you in Melbourne as your wintertime is approaching now. Looking forward to hearing more re: your own work soon! I love each piece you have discussed here, Patricia! 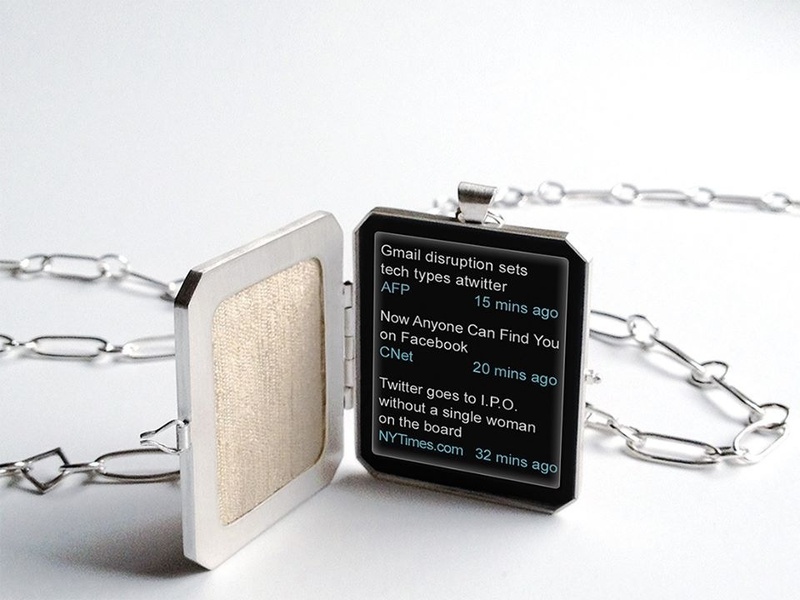 Your widget lockets are so cool. Brilliant! Anita!!!! I’ve been thinking of you today, hoping that maybe you’ve escaped the downtown Chicago summer heat of your studio and get to paint outside somewhere possibly cooler. Yes, that drive through I-95 N to upper Connecticut really had me worried but in the end, it was such a great metals’ show and Guilford – a gorgeous quaint town w/ every aspect at its New England finest. You made my day today w/ sharing such generous compliments re: my widget lockets and blog. Honestly, I can’t wait till your vacation brings you back to blogging, as I’m anxious to see more of your over-the-top FANTASTIC paintings when you return! Patricia, I can always count on your posts to help me expand my horizons. What an interesting selection of works by artists (like you) who are truly engaged in the world and make art that is meaningful, thought-provoking and relevant! What struck me as well (as you point out) is that the pieces, while being quite distinct individually, echo one another. Hats off to the curators; that makes for a very strong show (and your Widget Locket is perfectly at home there). I really enjoyed this post and your widget lockets are beautiful. Laura, thanks so much. I’m equally enchanted w/ your new “Wired” series of paintings. I appreciate your kind compliments and visit today! An insightful review, as ever, Patricia. How interesting that you and Ana M. Lopez seem to be following a similar exhibition trajectory. I agree, too, that you and Becky McDonah seem to be kindred artistic souls. It makes sense that you — among many others — reflect via various media the changes taking place in technology the subsequent implications on society. Artists are, after all, the antenna of the species. Thank you for sharing such eloquent comments w/ me, Gina! You nailed this thought directly when you said that tech does have an effect on current society. We as artists seem to be more willing to address this as an issue, while most people may still be content to just stare at their phones! I really appreciate your visit today and sharing your thoughts here.